Born together; best friends forever. 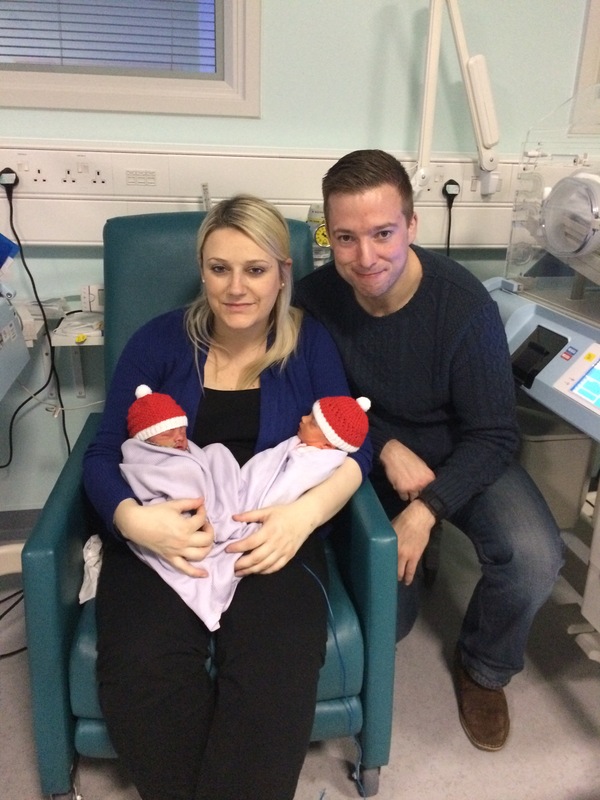 Katie and her partner, Mark, had quite the shock when she discovered at an early scan they were expecting twins. Here she talks about adjusting to life with not just one but two babies. So, there we were at our early scan with the sonographer searching for a heartbeat. I don’t know about a baby’s heartbeat but mine was racing ten to the dozen. I felt so nervous, just wishing and praying everything would be okay. “No” she said, “you’ve got two babies”. 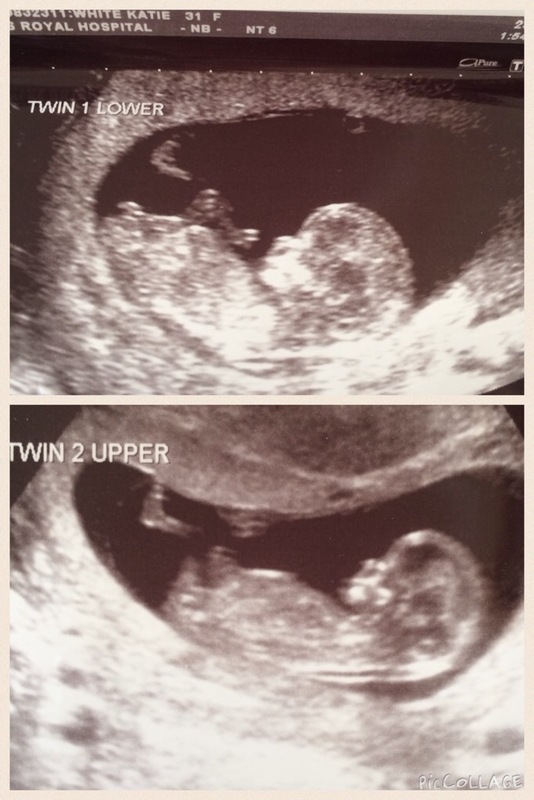 And there it was, just like that we had entered into the world of multiples. Mark and I’s initial feelings at being told we were expecting twins were very different. Mark was full of excitement. We had been trying for a long time for a baby and now here we were with two. I however couldn’t help worrying about all the things that could go wrong, I knew the risks were much higher with a twin pregnancy. I needn’t have worried though as the majority of the pregnancy went fairly smoothly. I was sick, tired and huge but that was all to be expected. Then, at 31 weeks I got pre-eclampsia and became quite sick. What followed was steroid injections (ow!) and day after day of blood tests, urine samples and blood pressure checks. A couple of days in hospital followed by a couple of days out, and this carried on until I was 33+5 days when the decision was then made that I would have them by c-section the following day. The feeling of guilt and worry over making sure that both babies got enough of my attention was evident right from the get-go. 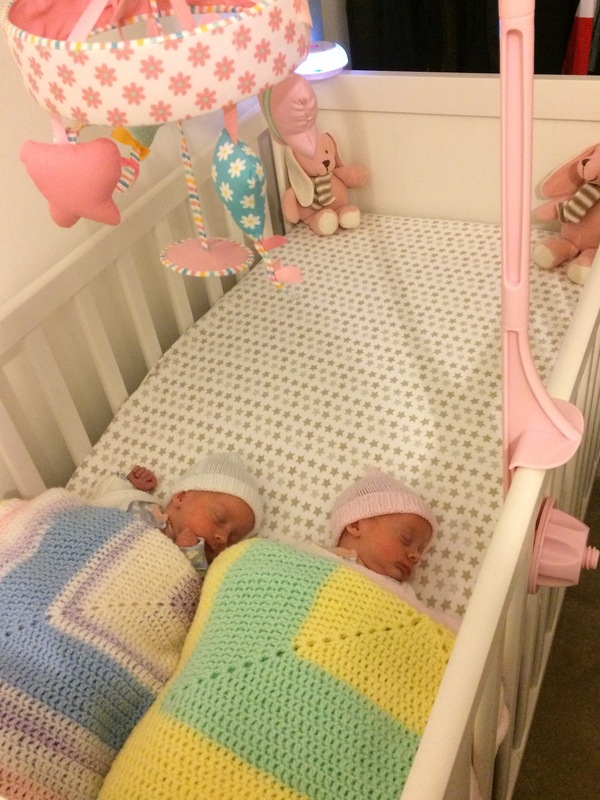 We knew they would be taken straight to the neonatal intensive care unit and had been fully prepared for this with a tour of the unit and meeting the nurses that would be caring for them. Poppy was the first born, a tiny 4lb7oz. Despite being the smaller of the two, she was stronger than her sister and albeit brief, we were able to meet for a cuddle and to get a wonderful first photo as she emerged from behind the screen. 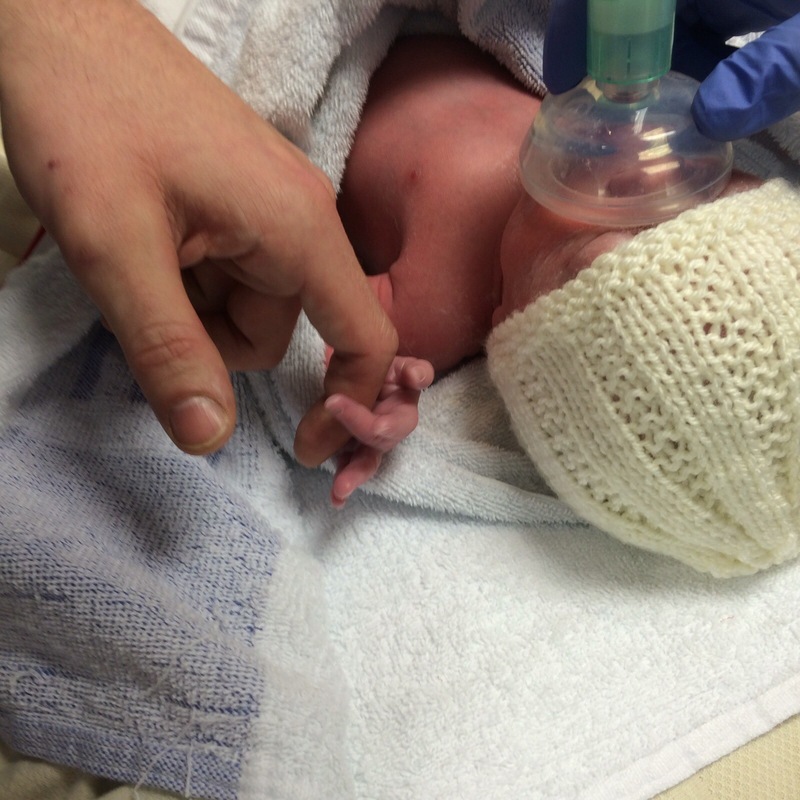 Reva, born at 5lb4oz, needed a little more support when she was born as she initially was not breathing. She was taken almost immediately of to NICU and I had not even had the opportunity to see her face. Within the first minutes of motherhood I was already wracked with guilt. I knew what Poppy looked like; I had held her, touched her tiny fingers and studied her face to see who’s eye’s, nose, mouth she had. 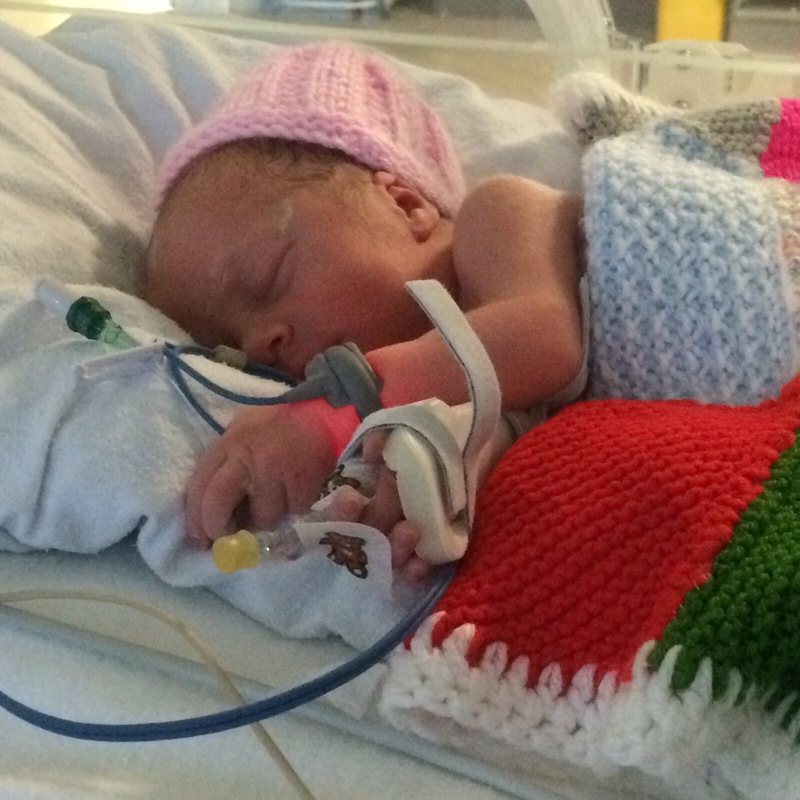 Reva had none of this from her mum and dad and was currently in an incubator all by herself surrounded by wires, alarms and monitors – a million miles away from the comfort and security of inside the womb. My heart was breaking, and to make matters worse I had lost a huge amount of blood during the c-section. I needed to stay on the recovery ward longer than usual, delaying the time before I could visit the NICU to be with either of my babies. The nurses were fantastic and I really cannot praise them enough for keeping me as updated as possible, even bringing me photos of the girls. As soon as I well enough they wheeled my whole bed from recovery into the NICU ward so I could be with my baby girls. So that was our birth story. No broken waters. No contractions. No breathing techniques (well obviously I was breathing throughout but you know what I mean). No initial skin to skin with Reva and very briefly with Poppy. No family photo straight after birth. No, it wasn’t quite the romantic birth I’d read and heard so much about but actually when I think back to that time I still feel butterflies of excitement because that was the exact moment our whole world changed. Our family became complete. It may not have been what I imagined but it was totally perfect for us because it allowed our girls to enter the world safely. As time has gone on I’ve realised that this is quite often the case with twins, you do what you have to survive and get through the day. It’s not always pretty, we don’t often get to enjoy that coffee at the baby groups, we can’t just nip into a shop to get something carrying our baby in our arms, and arriving anywhere within 30 minutes of the time we were supposed to be there counts as a win (twin mums with older siblings to get to school on time I salute you!) but that’s our norm and we wouldn’t have it any other way. If I had a pound for every time I was stopped in the street with the line ‘Twins? That’s double trouble!” I would probably have enough money to buy a brand new twin travel system complete with car seats and isofix bases! 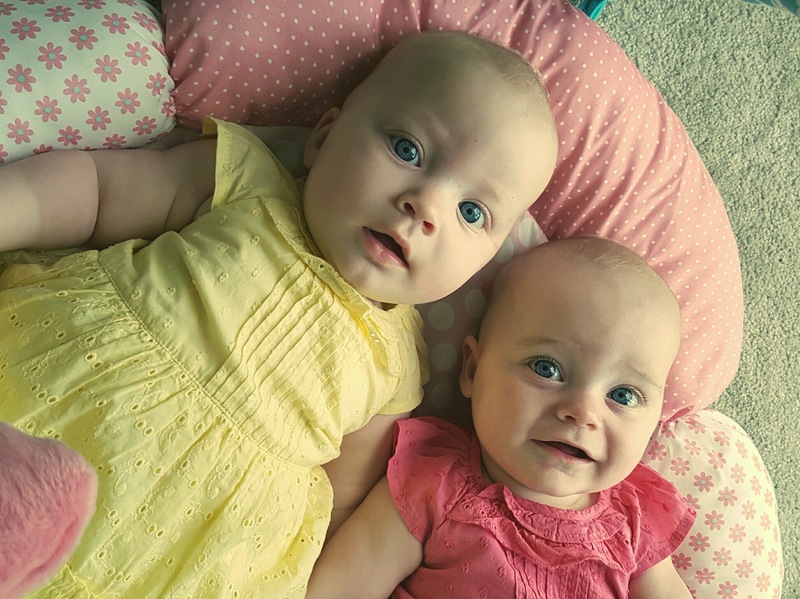 It wasn’t until I had my non-identical twin girls in 2015 that I realised quite how much interest there was in multiples, or how common it was with just about everyone I would meet having a neighbor/cousin/step sister who has twins. The comments are always the same with some of the most common being “are they identical? Do they run in the family? You’ve got your hands full!” and some of my least favourites being “oh what a nightmare” and “I couldn’t think of anything worse!” (Yes people have actually said this to me!). Oh, and I draw the line at having to tell complete strangers how my children were conceived. You’d be amazed how many people ask “are they natural?” The same people, I’m sure, wouldn’t dream of asking a singleton parent how their newborn baby was conceived but apparently this is acceptable with multiples. I don’t really mind though, I used to love showing them off (I still do, although at 17 months old it is usually them doing the showing off now when out in public!). I would just accept that a trip to my local supermarket would take around 30 minutes longer because I would have to allow added time for introducing them to every other person and then the same people again a few aisles down. Sometimes if I’d had a particularly sleepless night I would feel myself getting frustrated at having people constantly wanting to say hello and ask questions, then I would feel a pang of guilt as I realised that a newborn baby had a magical way of putting a smile on a stranger’s face and so to see two newborn babies together at the start of their lifelong journey of friendship is really something special. It’s no wonder there was so much interest, and I felt proud and pleased that my girls could put a smile on people’s face just by being them. 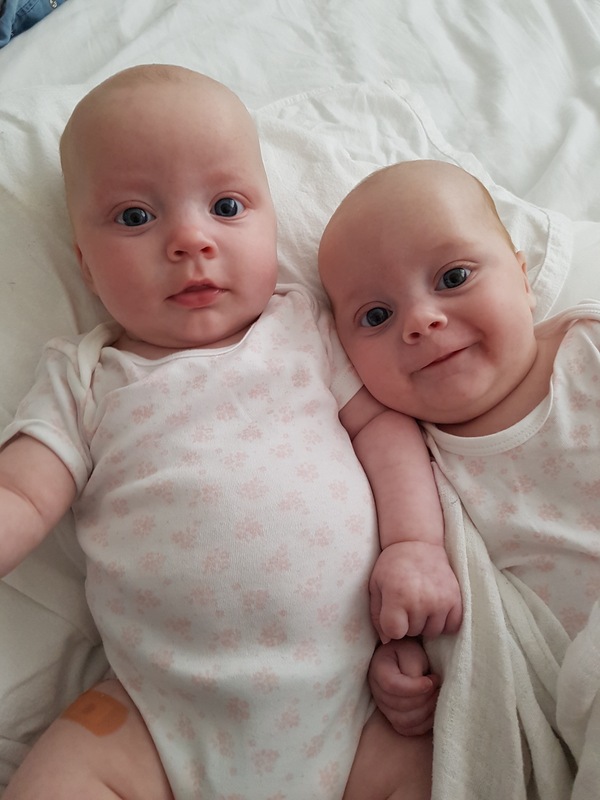 One of the most common questions I get asked once we’ve established that they’re both girls, they’re not identical and that yes there are twins in my family is “how on earth do you manage?”. The truth is, I manage just the same as any other mum regardless of how many children they have. We’re all managing the best way we can whether we’ve got twins, siblings of different ages, are a single parent, working parent; whatever our circumstances we adapt to them and we do just fine. The only thing I sometimes feel the girls miss out on are those quality one-to-one moments between mother and baby. Of course I still have these with my girls but they always feel more rushed and they generally end in tears from the other twin who is feeling left out. At 17 months the girls are beginning to become fully aware that they are sharing me and are beginning to fight for my attention which makes quality time with either of them difficult. Sometimes this makes me feel guilty but these feelings of guilt are quickly overridden as my heart feels like it could literally burst when I see my girls playing peek-a-boo together or clapping at each other as they pass toys from one to another, their new ‘thing’ is ring-a-ring-o-roses whilst holding hands and moving round in a circle and they will always trip over each other and go down before it’s time to fall down! So as the girls toddle their way out of babyhood and we embark on the next phase which is already promising to be full of laughs as they show us more and more of their individual personalities everyday, I can look back on the first year and say that whilst yes I have double trouble on my hands, I have double the love in my heart and feel extremely fortunate to be able to say that. 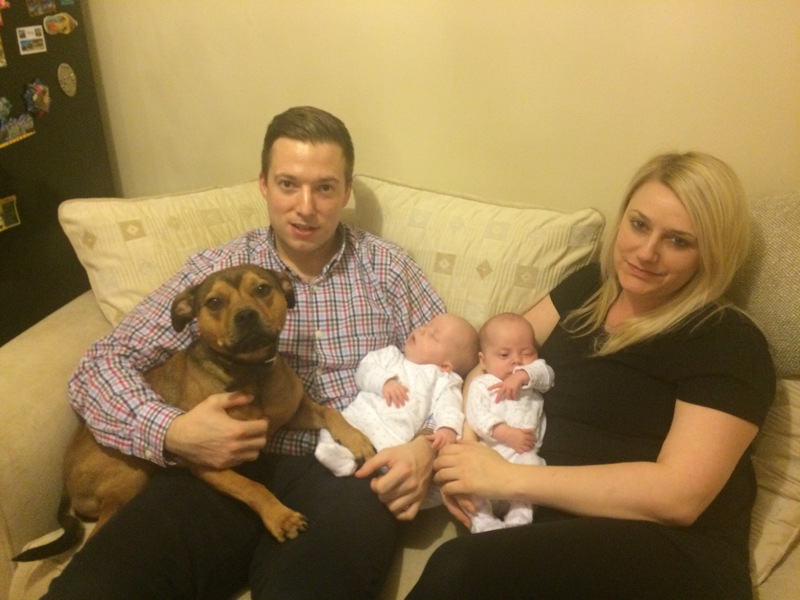 Katie lives in Cheltenham with her partner, Mark, their twin girls Poppy and Reva, and their crazy staffie Indie. She is a qualified baby massage and yoga instructor and owns Popsydolly, running classes for newborns up to walkers in Cheltenham. If you are interested in her classes, click here.